Works on everything that can run Stencyl and connect to the internet. Note: you must be using Stencyl 3.1 (or private releases from 3/29/14 or later) for this to work. Note: not created or endorsed by Imgur. 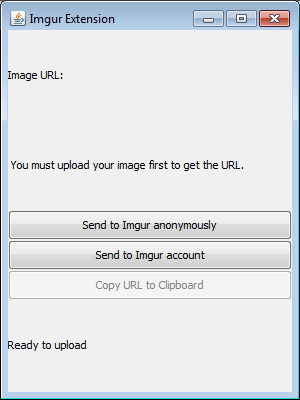 The Imgur Uploader toolset extension permits Stencyl users to quickly and easily upload screenshots from Stencyl to Imgur. This is extremely handy when you want to share your latest Scene screenshot, or the Behavior that is giving you trouble. - Skip the "Save File" dialog - or not, if you want! Special thanks to Justin for hosting the file. Once the extension is installed and enabled for your game(s), you can immediately begin using it to upload to Imgur anonymously. 0. Be logged into Imgur, or be prepared to log into Imgur. 1. In Stencyl, select the menu option Extension > Extension Manager. 2. Select the Options for the Imgur Extension. 3. Within the Options Panel, press the top button labeled "Open Browser". 4. Your default web browser will launch and direct you to Imgur. 5. Imgur will ask you if you want to permit access to your account for this extension. Allow it. 6. Imgur will provide you with a PIN for the extension. 9. If your PIN was valid, Stencyl will now have the necessary authorizations to access your account. 10. Press the "Save" button on the Options panel to close the panel. Currently, the only other option besides authorization-related tasks is "Save Image To Disk". If you check this box, the extension will permit you to save the image to a file on your hard drive as normal. If it is unchecked, the Save File box will not appear. This will permit you to both upload and save a local copy of your image if desired; or avoid the hassle of pressing "Cancel" every time that you don't want to save a local copy. Whenever you press the Camera button to capture a screenshot in Stencyl, the Imgur extension is triggered. A small window will appear in the top left of your screen. - Send to Imgur account : this uploads to your Imgur account. This button will not be enabled if you have not performed the authorization steps already. - Copy URL to Clipboard : this copies the image URL to the system clipboard for easy use. Unfortunately I haven't got it to work with Win7 and/or WinXP in which I download the latest builds. In the %APPDATA%\Roaming\Stencyl\stencylworks\extensions I've put your .JAR file. If I click the [*x*] screenshot tool, I do get the Dialog for the anonymously. When I use [copy URL to Clipboard] it will copy the www.stencyl.com URL. Stencyl.com is just a temp string so it sounds like the encoding is failing to produce the Imgur URL. I don't know what might be failing with the Options Panel but I will put a debug jar out to see what it might be. Thanks for the update. If you downloaded it before this post, please download the updated version (once the link goes live in the OP above). It's live! Special thanks for MdotEdot for helping test the issue! Note, with the soft-launch of 3.1, this toolset extension is no longer restricted to use by the customer-only private builds. Enjoy and let me know if there are any issues. I've not touched it since the last update. Why do you ask? This has been added to Justin's Polydes collection of open-source extensions. He has also graciously agreed to update it to work with current versions of Stencyl (if possible), since I'm on a different computer since when I made this and don't have everything set up for extension development at the moment. Feel free to peruse the (terrible) code if you are interested in how the extension was made! Updated to work! Both links above are updated to the most recent version of Stencyl.